Left to right: finalist Cameron Gaunt, presenter Penny Smith, winner Reuben d’Orten-Gibson and editor of World Pumps, Alan Burrows. 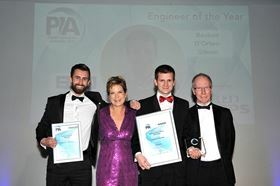 The winner of the 2019 Engineer of the Year award at this year’s Pump Industry Awards ceremony was SPP Pumps’ Reuben d’Orten-Gibson. The category sponsor was World Pumps. Mr d’Orten-Gibson joined SPP’s graduate engineering scheme in 2015 and quickly gained a reputation as a quick learner and talented designer. He later took a lead role in the development of a new pump model, where his enthusiasm for learning and talent for challenging conventional thinking were a real asset. Finalist Wilo UK’s Cameron Gaunt. Mr Gaunt has worked closely with Wilio’s R&D/competence teams to optimize the motors to operate with a range of VSDs. Mr Gaunt made a significant contribution to Wilo’s winning of the Operational Efficiency awards from Anglian Water and the Pump Industry Awards for innovation in 2018. The other finalist was Ru Well Systems’ Vyachelav Fisenko who helped develop a method for calculating indicators for evaluating the environmentally friendly operation of pumps in industrial and utility systems – to improve ISO / ASME / GOST standards for reducing the specific energy consumption of pumping systems.